Although tourist destinations often trade on their distinctive visual presence, often there is no lack of imitation to go along with the unique. Replicas of other places have long been a hallmark of tourism. Well before its renown for country music, Nashville, Tennessee, styled itself as the “Athens of the South” and even built a full-size Parthenon for its Tennessee Centennial Exposition in 1897. In more recent years, Las Vegas has borrowed architecture unabashedly from places as far-flung as New York and Venice. Few places have inspired more imitations than the New Orleans French Quarter, one of the featured destinations in American Tourism: Constructing a National Tradition. 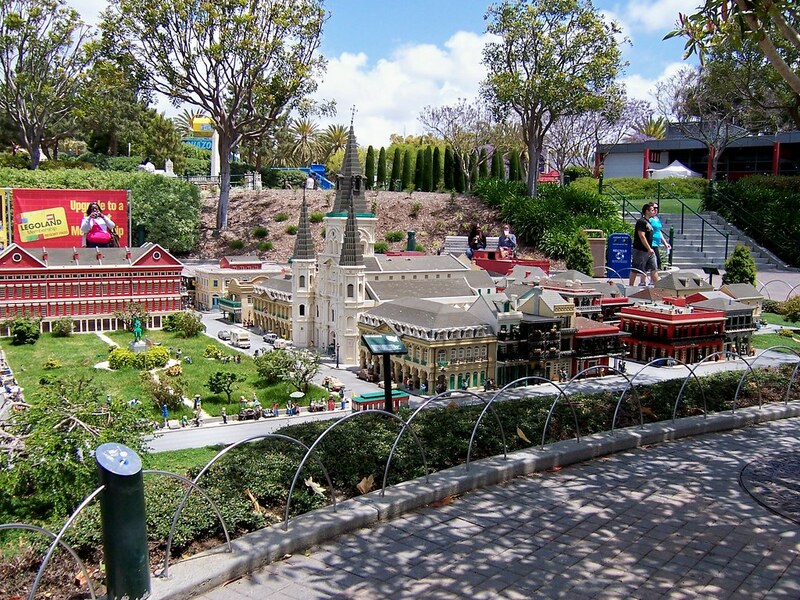 Much enamored of the Vieux Carré, Walt Disney added New Orleans Square, a miniaturized version of the famed district, to Disneyland in 1966. Twenty-five years later, Walt Disney World added Disney’s Port Orleans, a themed resort with one “region” loosely patterned after Vieux Carré architecture. 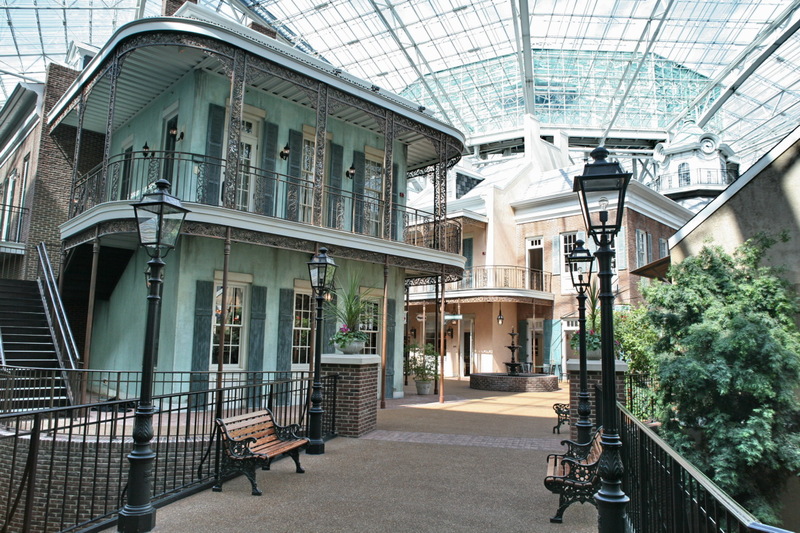 Nashville’s Gaylord Opryland Resort features an even more realistic assemblage of Vieux Carré buildings beneath its gigantic glass atrium. Even apartment complexes (French Quarter Apartments in Tuscaloosa, Alabama), motels (Holiday Inn–French Quarter near Toledo, Ohio), and mixed-use developments (River Ranch in Lafayette, Louisiana) have copied the trademark iron-lace balconies found in the French Quarter. 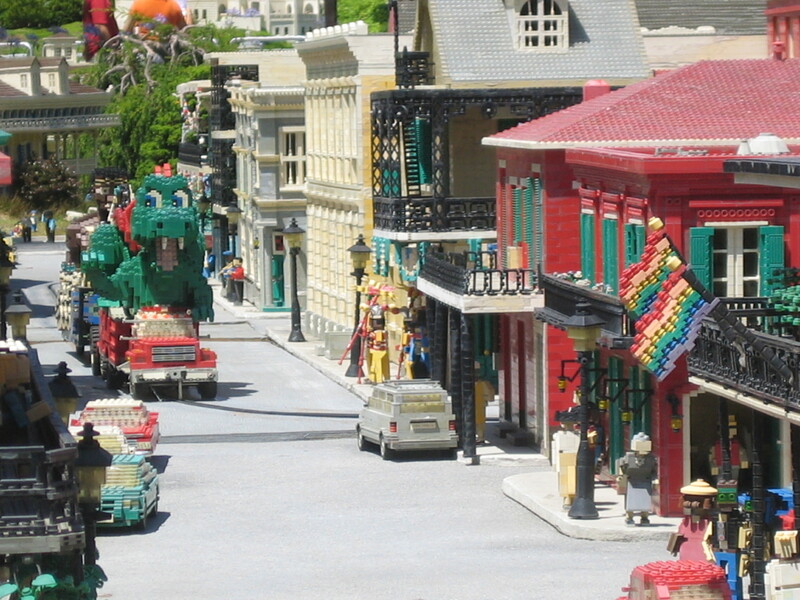 Perhaps our favorite example is the extremely miniaturized (1:20 scale) French Quarter model in the MiniLand USA section of Legoland California in San Diego, where a large swath of the Quarter from Jackson Square and St. Louis Cemetery #1 is recreated in loving detail with millions of Lego bricks! Have you discovered examples of French Quarter replicas or replicas of other famous places in your travels? Tell us about them! The R. C. Maxwell Company photographic exhibit on Atlantic City, New Jersey’s Boardwalk, curated by the John W. Hartman Center for Sales, Advertising, and Marketing History in the Duke University Libraries, offers an extraordinary glimpse into the excitement created by the company’s larger-than-life electric signs. One such image, taken on July 4, 1936, appears in Bryant Simon’s essay on Atlantic City in American Tourism. Following recent violent incidents on famed Beale Street, city leaders in Memphis, Tennessee, are contemplating a proposal by business leaders to impose a $10 fee on weekend nights, which would buy a $9 voucher for purchases in the tourist venue’s many clubs, bars, and restaurants. It is just one of several remedies under review. As the Memphis Commercial Appeal reported earlier this month, Memphis leaders are being very careful to characterize this proposed policy as anything but a “cover charge,” which carries the unwanted connotation of privatizing public space. It is indeed a touchy subject. 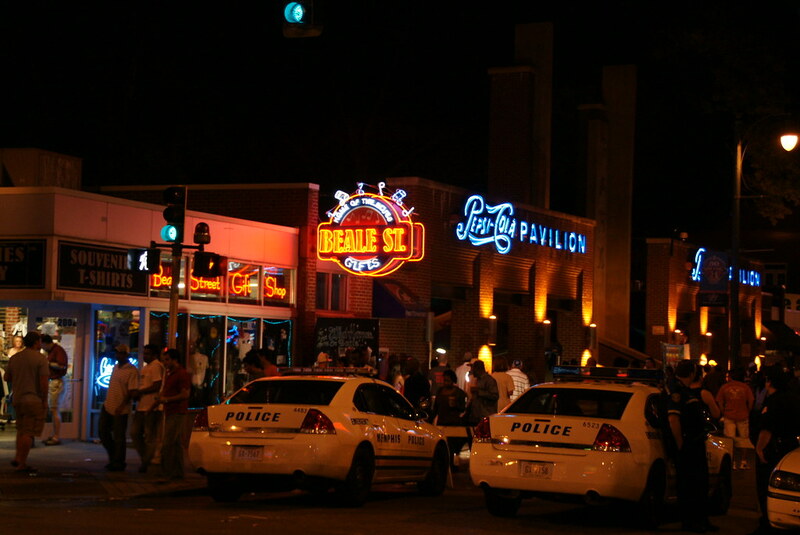 In 1982, as College of Charleston history professor Robert D. Russell describes in his essay in American Tourism: Constructing a National Tradition (Chicago, 2012), when Beale Street was considered “skid row,” the City of Memphis entered into a public-private partnership with a real estate management firm with the latter responsible for coordinating the process of making a short segment of Beale Street into a major tourist destination. Although the city government wrested complete control of the district from the private company in 2011 following a decade-long legal battle, Beale Street remains much more akin to an outdoor mall than an ordinary public street. The concern over loitering and crime is hardly unique to Beale Street. Plenty of other cities have devised various tactics to control crowds and police public behavior for years, often in ways that blur the boundaries between public and private space. It is hardly surprising that streets in tourist zones enjoy (or endure) greater control to ensure a predictable experience, but in recent years, the tensions that underlie the use of public space have reached a boiling point in many urban destinations. In 2010, for example, Cleveland, Ohio’s historic Warehouse District, which centers on a four-block-long strip of nightspots along West Sixth Street, a highly publicized incident outside a popular nightclub raised questions about racism, nightlife, and policing. In its wake, one Plain Dealer reporter suggested that Cleveland could learn from Memphis’s treatment of Beale Street, both in terms of its theming and its policing of public behavior. Memphis’s nighttime curfew, heralded just two years ago, clearly has not in itself proven sufficient to maintain the safe, predictable tourist atmosphere the city’s businesses demand (and that Beale Street delivers on most nights). Last summer, in the Cleveland inner-ring suburb of Cleveland Heights, the annual Coventry Street Fair ended with a suspected flash-mob incident that raised a similar set of concerns to those in Memphis and Cleveland. Nicknamed the “Haight-Ashbury of Cleveland,” Coventry Village is no stranger to difficulties with public behavior. In the early 1970s police fought a motorcycle gang that frequented the street, and the original street fair was shut down in the mid-1980s as it swelled to what some regarded as an uncontrollable crowd. Following the most recent unrest, which developed at the time police were attempting to clear the street, the city of Cleveland Heights imposed a controversial 6 p.m. curfew for unaccompanied youths in Coventry Village and one other popular commercial district, both of which, if not national tourist destinations, are certainly leading metropolitan-area attractions. From curfews to cover charges, urban destinations are the proving grounds for various tactics to maintain a carefully controlled environment. As explored in many of the essays in American Tourism, imposing control over places is a hallmark of tourism, and nowhere is it more challenging than in cities. Urban destinations reflect both the delicate balancing act inherent in restricting freedom and the ambivalence we continue to bring to our cities – places we seek for their excitement but also go to great lengths to make predictable. American Tourism: Constructing a National Tradition is now available to order from your favorite bookseller. American Tourism reveals the remarkable stories behind the places Americans love to visit. From Independence Hall to Las Vegas, and from Silver Springs to Seattle’s Pike Place Market, the collection draws back the curtain on many of America’s most successful tourist traps to reveal the carefully hidden backstory of transforming places into destinations. Readers will discover that a powerful creative process, rather than chance, has separated the enduring attractions from the many failures that litter the highways and byways of tourism history. American Tourism‘s thirty-five lively, illustrated essays tap the expertise of the country’s leading academic and public historians, writers, and tourism professionals. The contributors illuminate the visionaries who created iconic destinations and the business models that sustained the attractions once the founders had passed from the scene. In each essay the authors also highlight the design choices that made places memorable, the cultural work that turned places into experiences, and the long-term impact (both good and bad) of these sites on their locales, regions, and the nation as a whole. We, the editors, would like to thank our contributing authors for their dedication to seeing this project to fruition. Looking back through early email correspondence, we are reminded that this project dates to 2007, an illustration of how much time it often takes to shepherd a book to completion. It has been a great journey! In the 19th and early 20th centuries, the sweeping verandas of America’s foremost resort hotels served as veritable stages across which the nation’s well-to-do promenaded. As historian Jon Sterngass observed in his book First Resorts, such spaces offered perfect places “to see and be seen,” even as resorts like Saratoga attracted a broader and broader swath of American society. In Saratoga, the “celebrities” of the day literally strode high above passersby on the Broadway sidewalk below as if enacting a tableau. The United States Hotel, along with Congress Hall and the Grand Union Hotel, was one of the great elite resort hotels of the Western Hemisphere in the 19th century. Originally built in 1824, the United States Hotel (like many wooden hotels) went up in flames and was rebuilt on a grander scale, reopening in 1874. It weathered the gradual erosion of Saratoga’s popularity with the smart set, but after fifteen years of depression and war, American tourists turned their backs on most large Victorian summer resort hotels. The United States Hotel met the wrecking ball in 1946. Today few large Victorian resort hotels remain in the U.S. One of them, Grand Hotel on Mackinac Island, with its famed 660-foot-long porch overlooking Lake Huron and the Straits of Mackinac, responded to the loss of leisure travelers to newer destinations by courting the convention trade after World War II. Doing so enabled the hotel to maintain Mackinac’s genteel image, described by Steve Brisson in American Tourism, long after Saratoga had become little more than a place to bet on the horses.